We adopted a Pit Bull mix named Nikki knowing up front that she needed to be an only pet. She is an absolute love with people but reactive to other dogs. Walking her in our neighborhood where there are many dogs was scary because she reacted badly to all of them. We knew our neighbors were already leery about having a “Pit Bull” in the neighborhood and this behavior didn’t help. Our vet recommended Canine Case Squad and when we brought her for our 1st assessment visit, Nikki ran to them to shower them with smiles and kisses. We didn’t know until then that they had actually worked with Nikki when she was brought to the shelter 3 years before and she remembered them! Our training sessions really became about training us as she clearly remembered what she had been taught previously. Now that we have been trained, we understand why she behaves as she does. We have learned many ways to prevent her from reacting and we are able to confidently and easily walk throughout the neighborhood. As a result, our neighbors frequently comment that she is actually the best behaved dog in the neighborhood (we agree!). They repeatedly praise her behavior and are no longer afraid of her. We now tell anyone who will listen how wonderful the Canine Case Squad is. As a result of them, Nikki is a great Pit Bull ambassador in our neighborhood! I adopted a beautiful pit mix in July. While she was a total love bug with me and my roommate, I quickly realized that she was aggressive toward anything and everything else. She ended up biting several people over the course of two weeks. I immediately sought out help and went to a reputable trainer based out of Poughkeepsie. He took my pup in for 4 weeks and used a shock collar. She came back with an aversion to the shock collar and her behavior was worse. She began to redirect her aggression toward me. At that point I didn’t know what to do. I loved this dog more than anything, but after several bites I couldn’t take it anymore. My vet recommended Canine Case Squad and I went to them as a last ditch effort. I am so happy that I did. 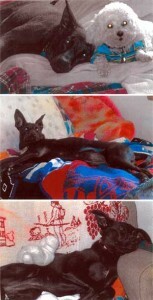 The Canine Case Squad team turned my dog, Billie Jean, around. Using what they taught me, I was able to get her behavior under control before they took her in for behavior modification. Once I got her back, she was much more relaxed and happy! Her demeanor changed and she went from fearful and anxious to goofy and full of personality at all times. It’s now 5 months after the end of the training and Billie is still making progress. Billie and I have successfully moved from NY to VA, and then VA to HI in a matter of a few months. This would not have been possible without the Canine Case Squad team. On top of the moves, meeting new people now only takes a few minutes using the techniques that Shari showed me. And while Billie will probably always be the only dog in my household, I am able to walk her by and with other dogs with no issues. They turned my aggressive dog that had bitten several people, into a dog that loves meeting and being around new people. If you put in the work and listen to everything they say, your dog WILL change for the better! Thanks again to Shari and the members of Canine Case Squad! Billie and I are incredibly grateful and now consider you all family. Hi Shari, I just wanted to give you an update on my amazing dog. He is so good. Calm, silly, goofy, everything that I want in a dog. He listens. The boy that he bit in the beginning came over on Saturday. 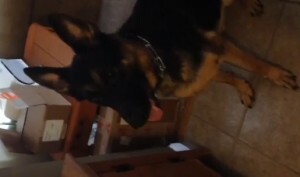 Jaxx went up to him, his ears went back a little and he then licked his hand. You were right, it was like he took a minute and thought about it. We still don’t let him roam freely when unknown people are over, but there is such an improvement, I am amazed. Again, thank you and your girls for all the help. There was a time I wasn’t sure about Jaxx, but now I would never give him up. Have a great summer and I will be booking for next year soon. Hi! Just wanted to share a picture of Lily giving kisses to my Aunt Leslie. Took Lily and Leslie for a walk and had Leslie walking her by the end. They’ve been best friends ever since. Lily has remembered her from when we did this walk and she has been fine with her ever since. This weekend we also let Lily out while my Uncle Mark completely ignored her and it went great. Just wanted to give you a quick update on our Luna and how much she loves her sister. The other day I was home by myself with the baby and Luna. I finally got the baby to go down for a nap so I figure I’d take a quick shower. I left the baby in the bouncer and Luna was on her bed with her bone. I came out of the shower to find Luna laying right next to the baby like she was just watching her until I got back. This just made my heart melt and made me so happy. Chrissy said she does it all the time but it was the first time I had seen it firsthand. We can’t thank you and everyone at the canine case squad enough. You have truly help make our lives complete. We will forever be grateful! And also on thanksgiving everyone came to our house, and some of our family who hasn’t seen Luna since we got your help were so impressed and amazed. She is such a great member of our family! Thank you so much for everything and may you enjoy the holidays! Thought you would like to see these pictures. 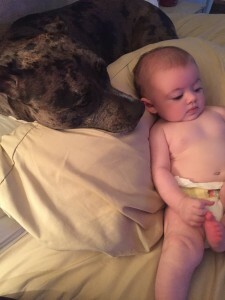 My once anxious dog is now the best babysitter and so patient with Charlie. They are definitely BFFs, thanks to you guys! I would highly recommend Canine Case Squad to anyone who needs dog training or behavior modification. My family had adopted a rescue dog at 4 months old. Kelly had been in a shelter for her entire life and had not been properly socialized. She had a sweet, extremely loving personality, but could be nervous and anxious when meeting new people or confronted with unfamiliar situations. 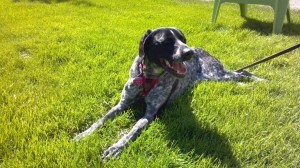 Our vet recommended Shari, Dan and Cindy at Canine Case Squad to help with Kelly’s issues. Canine Case Squad worked with Kelly and she was significantly and noticeably improved by the end of only her first session with them. 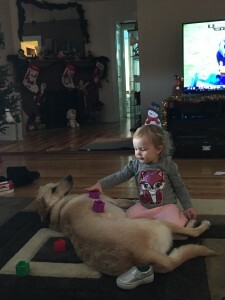 Canine Case Squad continued to work with Kelly for several months to modify her behavior and to train our family to better understand and respond to Kelly’s needs. 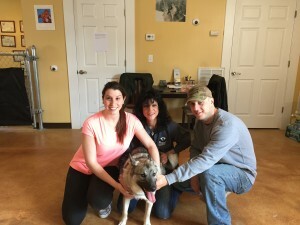 Kelly is no longer so anxious and nervous and has become a wonderful family member, thanks to the expertise of Shari, Dan and Cindy at Canine Case Squad. We truly appreciate all they did to help Kelly gain confidence and overcome her anxiety issues. They are caring, compassionate and very intuitive when dealing with behavior issues. It is almost a year since we needed your help with Sargent. The hard work has paid off he is so much better. Still not liking other dogs but we can control him now and his attention is on us. I have become alpha over him and he will do what I say usually on the first command. He has calmed down and is a pleasure to take on walks now. Leaving the house is also nice took work but we have got it down. Thank you for everything you have taught us! I will recommend you to everyone I know seeking dog trainers! Thanks again! Here is a video of us getting ready to leave the house, what a transformation! We met Max about 7 years ago. He had been abandoned by his family, and surrendered to the shelter. He was extremely anxious in his new environment. He was not eating well, and was expressing a lot of aggression toward people.A couple of trainers worked with him, but were not able to rehabilitate him. Their suggestion was euthanasia. 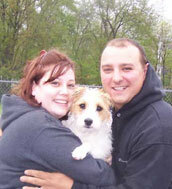 The shelter decided to give him one more chance, and hired Shari and Dan Forst to work with him. At first he showed aggression toward them, as he had with all other staff that approached him. However, this time his new trainers would not give up on him. They worked with him, and eventually he lowered his guard and became approachable. They knew that deep down Max had a sweet soul. He was just showing aggression because he feeling betrayed and scared. Eventually other staff was able to work with him, and that’s how he came into our life. We fostered him, with hope that he could find his new forever family. Well, we fell in love, realized how special he was, and he became part of our family. Max is alive and well adjusted today because of Shari and Dan Forst. There is no doubt in my mind that they saved his life. Many months can go by where Max does not see Shari, but when he sees her his happiness cannot be contained. Sometimes we joke that we think he loves Shari more than us. Well, maybe he does, and that’s ok because she is the special trainer that would not give up on him and gave him a chance at a better life. 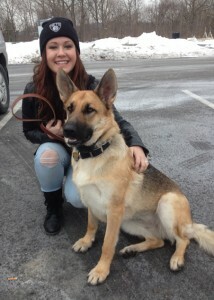 Dan and Shari,Almost a year ago I took on the responsibility of rescuing a beautiful pedigree German Shepherd. I was informed by the shelter that this dog had some issues and very little was known about her history. The fact that I love this breed (had two non – rescues) in the past) had myself and family a good candidate for this adoption. Not long after being home with us I realized we had our hands full. This dog was almost at a “feral” status, not housebroken and no training. The dog (we named her “Belle”) showed some aggression mainly at my wife and daughter. We found a trainer right away. 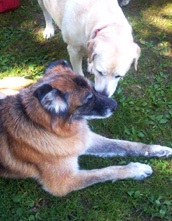 She was very good with our dog when it came to Commands, but she could not resolve the aggression issues at all. We stopped the training and soon afterwords Belle was at an all time low with her aggression both at home and in public. As much dedication and responsibility I had towards Belle I felt as though we may not be able to keep her. I spoke to my veterinarian about this and Dan and Shari were recommended. This was my last resort. Upon our first visit Dan and Shari witnessed the aggressive behavior. They did mention it would be a lot if work to help Belle, but she was far from hopeless. During our sessions many new methods were used and practiced at home. We soon noticed a major improvement! I now can trust Belle with the rest of the family and she has gained a new respect towards me (I am the primary handler). Belle still has a lot of work ahead of her, but it is all uphill at this point. Thanking you guys with all our hearts for what has been accomplished. 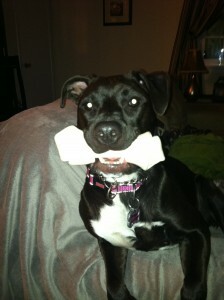 Hi Shari,Thank you for assisting us Stella, our beautiful, high energy pit mix. She is a ball of energy, who needs plenty of exercise and boundaries. 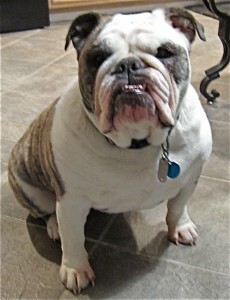 Now that we understand Stella’s needs and she understands our expectations, she is a fabulous dog. She needs a strong, confident owner and I believe we are that now. You have given us all of the tools to succeed. You really changed our lives, and we are so appreciative! 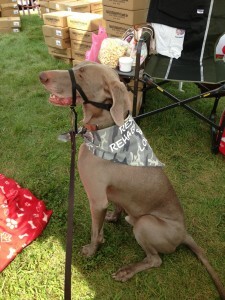 Gunther was recently at a big rescue event in NJ representing Tri-State Weimaraner Rescue, I had a bandana made for him that says “Rescued, Rehabilitated & Loved” He is such a good boy, really can’t believe he is the same dog that I adopted in 2007. Thanks so much to you and Dan for helping me. Thank you! 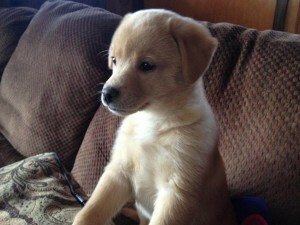 Shari, I’d like to thank you for the wonderful job you did with Sammi, our Golden Retriever pup. I would like to take the time to tell everyone who has a problem with ther puppy or dog, to contact Canine Case Squad. I have never seen anything like this in my life. Our pup went from nipping and jumping on everyone to being calm and friendly in just 2 sessions. I couldn’t have my grandkids or my great nieces in the same room with Sammi. Now they are best friends and love to play together.I couldn’t walk her on a leash, she pulled me all over (even actually off my feet, breaking a small bone in my foot and tearing a ligament in my knee!!!) Shari taught me how to handle Sammi and the proper collar and leash ( which she gave me) to use and keep. I can now walk Sammi on the road and she stays right by my side. It’s fabulous!!! I can take her in the car to the park and the vets etc. and enjoy our time together. To think my family was ready to give up on Sammi because she was so wild and uncontrollable. I’m so glad we found Shari and the Canine Case Squad. You can see that they really love what they do and they love the dogs!! Sammi is a prime example of Shari’s good work. And I can still depend on her to be there for us if we have any questions or need any help. I can’t praise or thank Shari and the Canine Case Squad enough. Shari & Dan have helped me and my dog Leo more than I can really say. They are excellent people who genuinely care about their clients. Without their generosity and dedication to helping dogs and their families, I would not have been able to afford the sessions and would have ultimately had to give my dog away. He was very reactive and I had little to no control over him when we started. 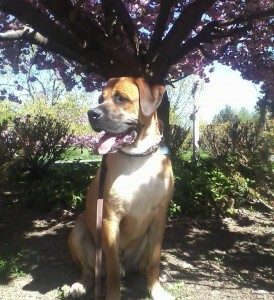 He is a big, 100 lb dog that would bark and lunge at every stranger we passed on the street or came to my house. We tried training, but nothing worked until we were referred to Canine Case Squad. After five sessions with Shari & Dan, I feel very comfortable taking him on walks and can control him when he’s being over-protective about the house. 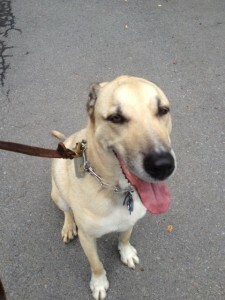 They were always prompt in their responses to progress reports and questions, which helped me understand my dog immensely, and the process, while difficult in the beginning, was something that was fun for both Leo and I by the end. 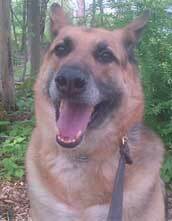 We were in constant communication and always altering exercises to best suit my dog and his environment. During the sessions, they made sure I saw and understood all of his cues so I could divert an outburst before it happened. With Shari handling and Dan distracting, I was shown how well my dog could behave and the kind of instruction and praise he responded to, which helped when I took him and worked with him on my own. I can’t believe how simple an instruction I can give and how well my dog listens now. He’s shocked many people with his turnaround, and I am so proud of how far he’s come with their help.I recently moved away and Shari & Dan not only made sure that the next person Leo and I worked with would be a good match, but they shared plans with him and have extended their help beyond our five sessions. Although I know we still have some work to do, I am so much more confident with my dog than I was, and because of the start we were given I know that he will be the sweet, happy and loving dog that I know him to be. 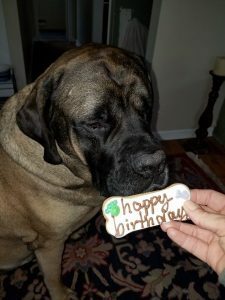 Shari & Dan really saved my dog, and I cannot recommend them highly enough. 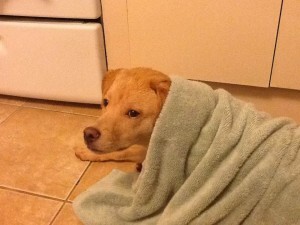 My husband Nik and I adopted our golden mix Harry when he was 3 months old. When we first got him he was loving towards us but had a hard time with other people. He would always back away and growl when others tried to pet him or go near him. We were concerned. We heard about canine case squad from our vet and we decided to give it a try. Well… It has to be the best decision we have ever made. Thanks to Shari and Hank, Harry is a different dog. He is now playful and lovable towards everyone. Shari guided us in the right direction and was always available to answer any questions I had. Nik and I went from being nervous about having people over to not worrying about it anymore. With the wonderful insight and strategies that Shari gave us we were able to work with Harry to help him become comfortable with so many things. Before he was unable to be brushed at all, after watching Hank (the best teacher) Harry now enjoys getting brushed on a daily basis. We would recommend Canine Case Squad to anyone who needs help with their dog. We are so proud of Harry and the accomplishments he has made and we are so thankful to Shari and Hank for helping us get to this point. We couldn’t have done it without you!!! Wanted to give you a quick update on Harry. He has been doing so wonderful! We are so proud of him. He continues to walk great on the leash and respond to all his commands. I attached a picture of him wrapped in a towel.. Yes a towel..lol although still not his favorite thing he actually allows us to dry him off. Nik even gave him a bath in our shower. We are taking him with us in a few days on his first vacation to the beach. 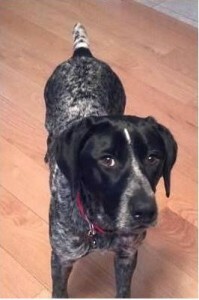 Thanks again for helping us and we are looking forward to possibly starting our off leash training with u in September! We received a beautiful thank you card from our clients Rich and Kristen Connolly and their dog Molly after our final session this morning! 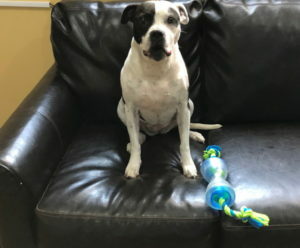 They were kind enough to make a donation to The Warwick Valley Humane Society so we can continue to help dogs like Molly 🙂 thank you so much guys! You did an awesome job with Molly, we are so proud of all three of you! I adopted Ginger after she almost killed one of the dogs she was living with. She was always very sweet with me but could not see another dog without trying to kill him / her. After doing some work with Canine Case Squad and continuing to do what they told me, she slowly got better at ignoring other dogs. Here she is making friends with two new dogs that she just met. I have worked with numerous dogs over the years, both my own and clients’. 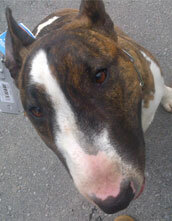 I have NEVER had a dog so….. challenging….. as the young Bull Terrier that I currently live with. Bullies are notoriously difficult to train (in fact, at a major continuing education conference last year, a nationally known trainer/speaker said to me, “of course you’re having trouble with him – he’s a Bull Terrier!!!) and can be very dog aggressive. My dog has been raised with other dogs, comes to work at the veterinary clinic with me every day and had regular play-dates as a puppy, yet he still wants to kill every animal he sees. After working with him for almost 18 months, I had made progress, but not quite as much as I needed to feel that he was “safe”.I spent a 3 days working with Dan and Shari (should have been more, but I live 5 ½ hrs away). 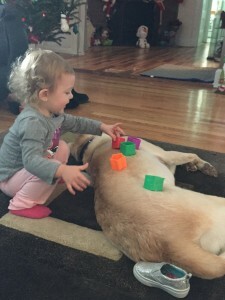 I have to admit – as a trainer, I felt somewhat foolish asking for help with my own dog! 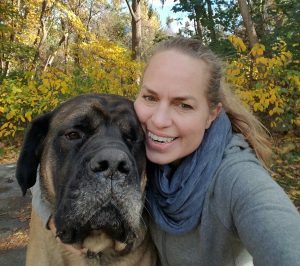 They not only made me feel comfortable (a quality that many “dog professionals” lack, and one I feel is absolutely necessary in order to work as a team to manage the dog), but took the time to really get to know my dog.I cannot say enough about how thrilled I am with the progress my dog and I have made since our training! Particularly in that I am able to recognize subtle changes in his body language that allow me to redirect him before he reacts which has helped him learn to redirect himself. (as I am writing this, another dog is barking 2 rooms away – where my dog used to lunge at the door, barking and growling, he just stood up, barked twice, checked in with me then went back to his bed)I absolutely would recommend Dan & Shari, especially for aggression. I’m just writing to let you know that Tank is doing very well. During our ride home he was very calm and well behaved. I left the back window open for him and he enjoyed sticking his head out the window to enjoy the air. He has already met all the members of our family and even some of my youngest daughter’s friends and everyone is crazy about him. He has already gone on five walks since we got home. We want to teach him to fetch and to play ball with us. We already played ball in the house but he was slip sliding all over the place. I can’t wait to take him to the beach, but first I must teach him to follow me without a leash. I don’t think it will be hard because when we were walking him, I had either my husband or my daughter hold the leash and I walked in front of them and Tank stuck right by me. His favorite place in our house is at the top of the stairs in an area where he overlooks the whole foyer below. He also enjoys sitting outside on the deck overlooking the pond. I will take pictures and will send you. Also, he loves to eat!! But, don’t worry, I will not make him fat. Besides, he will be getting plenty of exercise. We all ate dinner together and, of course, Tank joined us. He woofed down a whole plate of spaghetti! LOL He also loves ice in his water and pig ears!! Right now, he is snoozing next to me at my feet. We are all elated! He has brought so much happiness into our home! Thank you for all you have done for him. We all can’t believe how well behaved he is!! You have obviously done a phenomenal job. I’m sure it was very dangerous for you. I know you told me he attacked your face. Being an animal behaviorist is not an easy job because certain behaviors are deeply imbedded and it takes alot of experience, patience and persistence to change them – especially when a dog is already an adult!!!! We cannot believe that this sweetheart of a dog had anger issues. He’s already started giving me kisses!! I really think that he was frustrated because he had so much energy and was not being used. And, he noticed that bad behavior got him attention and so he took advantage of it. By the way, the kids get a real kick out of the fact that his commands are in German!! Anyway, I will keep you updated. Tank is now my little mini-me, my new BFF, and my homie. LOL. We all love him dearly. It won’t break our heart to look at pictures of Rocky anymore (they’re all over the house), because Tank has filled that void. Rocky will always remain in our heart and our memory, but it won’t be painful anymore. I’m watching him now as he sleeps by my feet… he is soooo beautiful. We are truly blessed! Again, thank you so much for all you have done for Tank. If you weren’t so good at being a behaviorist, we might have never had this opportunity to have such a beautiful addition to our family. God Bless you! (Update on Tank) Hi Shari,I just wanted to give you an update on our little Tankeroo (as we call him).Tank is doing extremely well. He has adapted very well to his new environment and is a very intelligent, considerate, playful, and affectionate companion with a great sense of humor. And, I have never felt so protected and secure in my life. Basically, we don’t consider him to be a dog. He is a human being in a dogs body. Everyone says that about him.My little Tankeroo spends all his time with me. We do everything together and he goes everywhere I go. I did this from the beginning in order to socialize him and to get him used to interacting with people. I bring him to job sites where my husband has projects (there are sometimes over 20 workers not to mention trucks and cars coming and going) and he just roams around freely without a problem. All I have to do is whistle and clap my hands and he comes running. I’ve also brought him to the airport at least four times since we got him and although I kept him leashed and close to me, he was just fine. I still have to keep him away from children and other pets but that is not a problem that cannot be controlled.His scheduled walks are every morning before we leave the house for half an hour (leashed), and every night at eight pm (he’s usually with me the rest of the day). Our four cats know when he is home and so they disappear when he is around. This is something we are still getting used to. In order to give the cats some sense of freedom around the house and to still spend time with us, we gave Tank his own room.The routine is every night after his eight o’clock walk, I stick his snacks in his mouth and we walk upstairs to his room without incident. Although he is allowed to sleep on the bed, he chooses to sleep in the large walk -in closet with his toys. I keep his water and spare snacks in his bathroom. It was so funny, because the first night we put him in his room and closed the door, I came downstairs, and before I had a chance to sit on the couch and relax — here comes Tank gallivanting into the den with his tail wagging, his ball in his mouth acting all playful and happy!! With this “ha ha I got out” attitude. He plays tricks on us all the time! Yes, old Tankeroo can open doors!!!!!! We were hysterical laughing. So, now we have to secure the door from the outside. The first two nights he was restless, but I would go outside the door and calmly let him know Mommy is here, you’re a good boy, go lay down and we’ll go for a walk in the morning – and it worked.Everyone laughs at me because I speak to him — but, he understands!!!!! If we all have to go out and leave him at home, I use my open palm in his face command with a “stay” at the door, and he knows he has to stay home to guard the house. Of course, I also tell him to guard the house and don’t let anyone in, and to protect our cats. That’s why my family laughs at me.As far as food goes…he doesn’t eat dog food or any kind of pet food – canned or dry. I tried about four different brands before I gave up. SO, he eats people food. The first week I was worried because his feces were watery and very loose. But now he is pretty regular and they are hard. He’s pretty finicky and doesn’t eat too much. I give him cold cuts, chicken and meat, cooked differently everyday. He also likes to jump up to catch greek meatballs and chicken nuggets in the air. I usually get him a large inexpensive T Bone steak from the supermarket and he munches on it for hours.So, I haven’t even told you half of the activities Tank has been involved in, but that would take forever. All I can say is that he leads a very active lifestyle and by eight o’clock each night – he is pooped!!! I must tell you though that he is now an avid swimmer (he was such a chicken in the beginning), he loves walking along the beach, hiking through the woods and he LOVES car rides. OH! I have to tell you… we even put him on a pool slide and after sliding into the water, he swam out of the pool and all playful and jumpy ran back to the ladder and started jumping on the steps cuz he wanted us to lift him to the top again, so he can do it again!! He’s such a copy cat he wants to do whatever everybody is doing. I’m telling you this is not a dog, this is a teenager in a dog’s body. When our Godson (he was here all summer) was packing to go back to Greece, we had his suitcase on the floor and we were kneeled next to each other putting his clothes in the suitcase. Well, of course Tank has to be involved in everything. He comes in between us with his huge bone in his mouth and plops it in the suitcase on top of the clothes, and THEN hops INSIDE the suitcase and just sat there, as if telling us I want to go too!! I could go on forever, but I think I bored you enough.But, yes, Tank has definitely brought so much to all our lives. EVERYONE loves him. He has become my daughters’ and their friends new toy. And again, thank you for all you’ve done for him. Although now he is “appropriately” protective, I could never have imagined this sweetheart of a dog ever having such severe aggression issues where he was taken from his previous owners!! I don’t know how you did it, but he is very well trained and very cooperative – not to mention, loving!! You have done an excellent job in resolving our dog’s behavioral issues to bring out his true affectionate and playful personality. You are truly gifted! My family and friends cannot thank you enough! I just wanted to give you a quick fun story about Fynn! This Sunday I went to the Connecticut Robin Hood Spring Festival in Gulliford. It’s a LONG car ride, but I wanted to bring Fynn along with me since it was their pet weekend. I was going to be working for a friend of mine, giving him breaks at his booth, so Fynn and I had somewhere to hang out so we would not be walking around alllll day. He was beat when we got there and I walked him in before they opened. He hung out and slept while I changed into a costume so I could work and then the rest of the day stayed by my side on the leash, played nice with other dogs, did not bark to see other dogs or people, cried only once (to a German Shepard pup which was odd). People were asking me how old he was and when I told them four months they were BLOWN AWAY every single time. “Oh my god he is so well behaved!” “I wish my adult dog was this good!” “What do you do?” “Can I take him home with me?” Was the constant response. I had someone, while I was helping out in the booth (to which Fynn simply lied down in a corner or sat and sniffed a foot or two of a passing person calmly) bring his wife over and ask me a million questions. I told them “hey, this is what works for me but you are better off getting in touch with a professional. That’s what I did”. I did not have your card but I gave a few people the web site. SOO many people told me that they had “bad dogs.” That made me so sad. But there were so many good dogs there and it was a good experience for Fynn to socialize, especially with other puppies (there was a tiny Boston Terrier girl and oh lord the cute was unbearable). The long and the short of it is that I have confidence in myself and in him. (Both the dogs). Fynn came to me when he was worried about a passing horse or the parade (loud drumming and bagpipes) but not in an aggressive barking manner. He would simply be picked up and sit on my lap and watch, but continue to look at me for cues on how to behave. It was a really amazing experience and I don’t think it could have happened without your help. Thank you so much, I will continue with the behavior and hope that eventually the cat/dog situation and table situation will be worked out. They are such good dogs. (We even did 20 minutes of leash training in a field when I thought he was getting a little too bold on the leash. Did the trick right away! Who cares if I looked like a crazy person! IT WORKS!) Thanks. Shari, here is a picture of Ryder at a dog parade a couple of weeks ago. He is getting a kiss from a pit-bull. Something I would have never attempted before training with you. He was friendly with every dog there and also let all the children pet him. Never growled or barked at anyone, not even once. Thanks for your help. We got our second dog, Woogie, at a shelter this February. 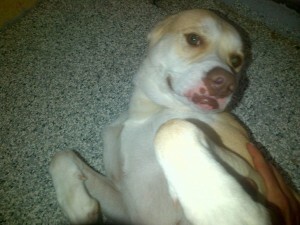 Woogie is a sweet and loving boy within our 4 walls. While he was trainable in the house, taking him outside was a different story. He barked at, and focused on, every dog, car, truck, and motorcycle, and would pull hard toward everything he saw. It was as if he forgot how to listen once outdoors. Plus, he was stubborn and would never perform the sit/down command outside. Our goal was to get him listen and respond to us all the time, as well as behave nicely while on a walk so that the whole family, including our first dog, could enjoy a walk in public. A call to Shari of Canine Case Squad was all that was needed to get Woogie in line. Shari helped us understand the dog pack mentality to establish us as pack leaders. It was rewarding to see Woogie’s progress from week to week. I could see our relationship changing, and he became a happy and relaxed dog in our yard, and eventually, in public. 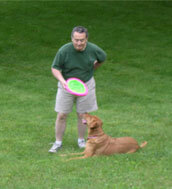 It was also a great refresher course for our almost 8 year old dog, Bella. 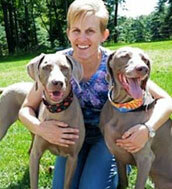 Shari has such a passion dogs and her work, and CJ is the best canine teacher! After our 4th week of training, I felt confident enough to take Woogie to Monroe’s public park green by the ponds on my own. He was close to perfect in his behavior and walked so nicely even while passing other dogs. You will see from the pictures that Woogie has mastered the sit/stay and down/stay command outside. He’ll do it while other dogs are passing by, too. Success! We will be seeing Canine Case Squad for Woogie’s off-leash training soon. Thank you, Shari and CJ, for making Woogie the good boy I knew he was. Please feel free to use me as a reference! Hey Shari! just wanted to let you know that bailey is doing well. he sits and waits to go out the door, front and back doors. when my grandchildren were here and eating at the table bailey would come into the kitchen and then lay down when I told him “down”. he didn’t bother them for food. outside in the yard he comes more often than not when I call him to come. he doesn’t bark for peanut butter when he throws his bone. now he will lay down next to the bone and I will only give him the peanut butter when he loses interest in it. he is great on the leash, even though we haven’t been able to walk as often as I’d like due to the heat. (neither one of us tolerate it well!). we are practicing in the yard to sit stay, down stay, down and then sit, stay and come. he is doing well with the commands and I am still learning as we go along. thanks so much for everything you did and thank cj too. she taught bailey well. our friend brought their Sheppard over and we introduced her to bailey. he treated her with respect just like he did CJ. I loved it!!! Say hi to Dan, hope all is well with you both. please stop by sometime just to say hi! 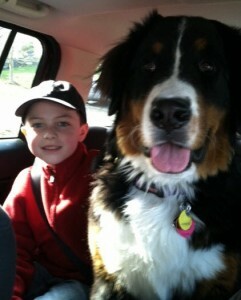 Shari – Dimitri is amazing, 1/2 hour into the car ride home he became a different dog. I have had shepherds since the age of 9, my entire life, I have never had one this loving and affectionate – especially in the first 24 hours… I brought him to my house first and we had a blast – he walked beautifully on the leash, listened to ever single command, ate nicely from the bowl that I held and was completely fine with the 5 new people (neighbors) he met. We ran around my yard for over two hours – I took him to Maz’s later in the evening and he spent the rest of the night laying at our feet on his back, rubbing up on us like a cat and licking our faces..he is a mush- a pretty well mannered one at that thanks to you…I have a few pics that I’verr posted from today…there will be plenty more to come…thank you again – he is an absolute joy and I couldn’t be happier to have him (even if its joint custody!) He finally fell asleep on my lap, literally in me arms like a newborn baby. We couldn’t have asked for a better dog. Hey FB peeps- just wanted make a suggestion for any of you that are considering a new pet- Before going to the pet store or a breeder…please think about adopting from a shelter first- there are too many loving animals that need good homes- my Dimitri is a perfect example, a diamond in the rough that just needed a little patience and extra attention. Honestly, I couldn’t have asked for a more wonderful dog. 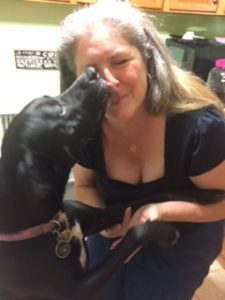 The right training will make all of the difference in the world and Warwick Valley Humane Society uses Shari Forst, an amazing trainer and behaviorist…she rehabs dogs into loving, well behaved pets- she did it for mine. Dimitri was uncontrollable and very aggressive when he arrived at the shelter- no attention span, wouldn’t make eye contact, lunging at people- even attempted to bite a few… if you were to see him now- you would tell me I was full of it- he is an entirely different dog, thanks to Shari. Again- the right training is invaluable- so don’t always be deterred by what you see in a dog when they’ve been abandoned and are living in a pen or cage surrounded by hundreds of other animals – they’re scared, lonely, out of sorts- and just need a little love and proper direction to unveil the loving, faithful companion they’re meant to be. If you aren’t in the market for a pet right now, then please donate to your local shelter- it takes SO much to house and care for these animals- they need ALL of the help they can get. Check the website of your local shelter to see how you can help today. Consider adopting a pet, save a life… they know, these animals- you can see the love and gratitude in their eyes, I promise you. Dear Dan and Shari: Canine Case Squad. We just wanted to express our deep appreciation for your fine work with Kobi. When the animal behaviorist we were working with locally, stated that they were not able to correct his aggressive behavior, and suggested that our best chance was to travel over 900 km to visit you for some compressed training, we were a little hesitant to make that kind of trip. However we love Kobi, and wanted to try anything to get him to the level where he could meet someone new without trying to attack them. 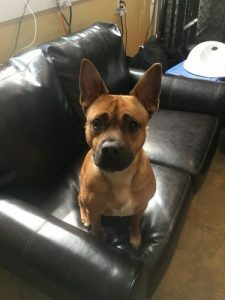 Before we visited you, the trainer who we had worked with for 10 weeks was still not able to even touch Kobi, and our behaviorist was also very afraid of him and uncertain of how to proceed. 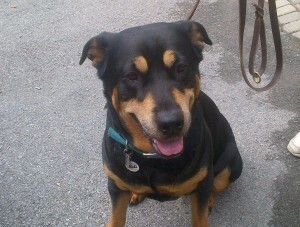 Lucky for us she had heard about the success Canine Case Squad had with aggressive dogs including German Shepherd’s. Within 2 hours of meeting him, Shari had Kobi to the point where he was obeying her commands and eating out of her hand. We were extremely impressed by this. After working with you just two days, we decided to venture into New York City and drive around Manhattan since we had some time off and we were so close. We were cautiously optimistic of how Kobi would behave to the multitudes of people on the streets, but we were shocked at how well he behaved. He didn’t bark or get anxious at anytime. 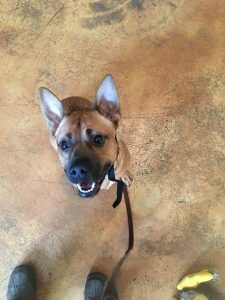 By the time we completed the hands on training with you, he was able to walk close to other aggressive dogs without paying much attention to them. Since we have returned home, Kobi is much more relaxed and happy and we are elated with the complete change in his personality. We know that the time and money spent on the trip to visit you was an incredible bargain based on the quick and very effective results. As we told you, Angelica’s sister and her family had been staying with us for Christmas and after living here for just over a week, Kobi was starting to accept them before we left (not biting or attacking, but wearing a muzzle or gentle leader whenever he was in the same room or area as them). Within minutes of us arriving home he was treating them like he treats us. The next day he was playing with them without his collar on. They were so impressed and pleased because they are dog lovers too and they really wanted to enjoy him. We had my parents over for a visit us 2 days ago and he was calm and gentle with them. He was actually eating out of my Mom’s hands with in 30 minutes of their arrival. They had been afraid to enter the house before unless he had his muzzle on and was on a short leash. They were very impressed by his apparent transformation. We understand that we need to stay the course and continue to work on all the techniques you demonstrated and identified so that he can continue to improve, and we will. The improvements in him are incredible. From the bottom of our hearts, we want to thank you for making the time to see us and work with us, and especially for making Kobi into the lovable dog that we knew was in him. You have our undying gratitude. Just wanted to thank you for all your help with Gunther after the second incident with him. I thought that we wouldn’t be able to keep him, but was so glad that I kept searching and found you. Thanks again. Canine Case Squad have successfully turned an unhappy dog into a “Happy” dog. Our dog Tyler has responded very well to the training and the training has allowed his owners to have a strong and powerful bond with him. We thank Dan and Shari for all their Love and Support. They are the best! We moved up to Warwick NY this past March with our two cats and two dogs. 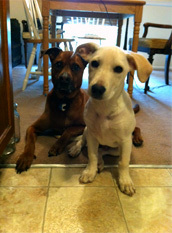 Sammy (Tan and Black) was part of a litter of pups that were abandoned in the Bronx and saved by the ASPCA. We adopted this handsome and sweet boy when he was 4 months old from Biscuits & Bath Upper East Side and he is now 1.5 years old. Cha Cha was a stray found roaming the streets of Brooklyn and we adopted this precious little girl when she was 7 months old from Sugar Mutts Rescue she is now 1 year. 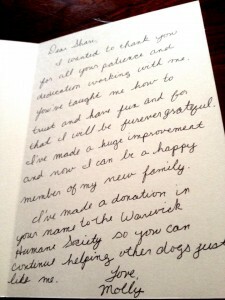 When we moved to Warwick we noticed that Cha Cha was incredibly fearful of strangers. And that Sammy was becoming very territorial of both our property and the two of us. Cha Cha would bark at a person she didn’t know continually and would run at them then turn away. Sammy would bark at people we walked past during our walks for no reason. 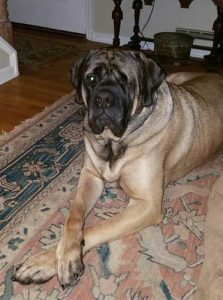 When I walked both dogs on my own it was really difficult to control them (100 lbs of dog is tough to handle for one person) We weren’t sure what to do – and decided we should call upon a specialist in dog behavior to help. Canine Case squad was recommended to us by a number of people including our vet. So I called Shari and set up our very first appointment – which was a 2-hour behavioral consult and observation at our home. 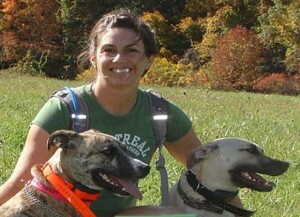 Right away we noticed Shari’s confidence and leadership over our two dogs. In that firs t two hours we learned more about a dogs mentality, history, and our role as pack leaders than we had learned ever before. From this first session we were given a number of pack leadership tools that are alleviating both dog’s dominance and fear. Her knowledge and ability to convey it to us was absolutely outstanding. Her love for dogs is obvious and our dogs absolutely love Aunt Shari. We then decided to sign both dogs up to 5 weeks of obedience training. 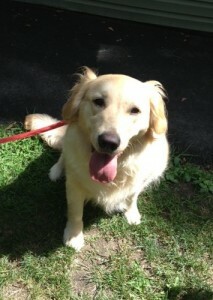 Shari came to our home each week and spent 45 minutes to 1 hour with us on what we’ve deemed our daily training walk. The dogs now heel when we walk, sit when a car is passing on command, will submit to a down position upon command and have great recall. All of this training takes work on the dog owners’ part – a lot of work. However the results in seeing our two dogs develop into healthy, stable and happy dogs is well worth all of it. We highly recommend Canine Case Squad to any dog owner for behavior or obedience training. To be honest any dog owner regardless of their dog situation would benefit from the tools provided by Shari and Dan. Shannon and I wanted to let you know how valuable we feel that your training has been for us. When we got Madrid, our Doberman puppy born in June 2008, we felt it would be very important for us to know how to work with her so that by the time she was full grown, she’d be well-behaved – no biting, aggression, dominance, out-of-control walks etc. Your training has given us the knowledge and skills to establish our family-pack where Madrid is learning her place and where we have a framework to address whatever behavior issues present themselves. Madrid is a very high-energy puppy and tests us constantly, but as we apply your direction we’re seeing that she’s responding to our lead: she amazes our friends with how long she’s able to hold a ‘stay’ with all kinds of distractions (including treats placed on her paws! ); she walks with us in a heel position on a consistent basis and when she does buck against it, we’re able to restore order relatively quickly; and in all sorts of every day situations we’re able to get her into a calm-submissive mindset where we can work with her as needed. We look forward to off-leash training in the future and would whole-heartedly recommend your services to everyone! We can never thank you enough for everything you’ve done for Nigel. When we came to you we were desperate for help, unable to control his aggressive behavior. We knew there was a sweet-tempered dog under all that misbehaving. It’s like we have a totally different dog now, every day we are amazed by his continuous progress. There was a time we thought we couldn’t keep Nigel and now we can’t imagine our lives without him. You guys saved his life, it’s as simple as that. Thank you both a million times over! Thank you so much for helping us teach our Jack Russell good behavior, commands, and cooperation. What a difference your sessions made with Jack! Everyone notices how calm and well behaved he is even if they hadn’t seen him before his lessons. Thank you for teaching us how to train our dog as well. We understand Jack a lot more now and we have used what you taught us to have a better relationship with him. It was well worth the time and effort spent with you and our dog because we could not be happier with the results. Thank you again. Sincerely and with great appreciation. Tye continues to do very well. We are slowly taking him off the Prozac and he hasn’t had any negative behaviors. He approaches other dogs in a friendly manner and eagerly seeks attention from people. Aside from making new friends at the Senior Residence, he recently accompanied me on a “rally” to fight for my health benefits at my place of employment. Tye wore a placket and attracted much attention. It’s hard to believe that our neglected, abused, anxiety ridden Standard Poodle is now so calm and friendly. 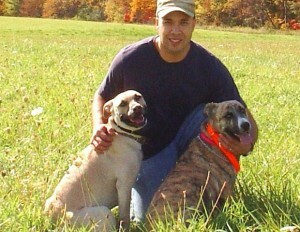 Thank you for helping us to become a “pack” and teaching us how to be the “alpha” that Tye deserves since his rescue. We will never forget our experience working with your “pack” and truly thank you for the wonderful family you have helped us to create. I thought of you often over this time of thanksgiving. In fact, I think of you almost everyday as we enjoy Tye’s company in many locations. He has many doggy friends in the neighborhood and often looks for attention from most people we encounter. I take him to visit my parents, in a retirement community, and the residents love him. He behaves perfectly as we ride up to the 6th floor in the elevator. My parents eave the door to their apartment slightly ajar. Tye is able to find their door and eagerly push it open with his nose. He happily and gently greats them and they are thrilled to see him. A few weeks ago, we took Tye on a vacation to Provincetown, Cape Cod, one of the most dog friendly towns in the USA. Tye loves the car and calmly sleeps in the back seat as we drive or enter a restaurant and leave him in the car. While on our vacation, we stayed in a dog friendly B&B, and saw dogs everywhere we went. He was very well behaved and made special friends with 2 other Standard Poodles (puppies). For the first time he was able to run free on the beach and approach the surf. He wasn’t interested in going in the ocean but he had a great time. We get so many compliments on his looks and his good behavior and for this we thank you. I remain the alpha of our pack and Eric and Tye are definitely siblings. Tye brings his toy to the backdoor as soon as he hears Eric’s car come down the driveway. We can’t thank you enough for helping us to become a very happy pack. We hope all of you are doing well. Bode is our young, rescued border collie. He loved to chase anything that moved fast. One day he tried to chase a school bus while on a leash. I tripped over him which led to a bloody knee and elbow. I felt it was now time to correct the behavior. My vet recommended the Canine Case Squad and a few days later Shari (after evaluating our needs) and her dog CJ began educating both Bode and me. She helped us communicate with each other. Dan helped us resolve a difficult question we had about Bode’s reaction to strangers that cropped up during training. I now understand my dog and he understands me. We enjoy a 2-3 mile walk almost daily and have developed a wonderful relationship. He heels, sits, stays, lies down and comes on command. He no longer chases anything that moves! He remains focused. What a wonderful dog! What a wonderful instructor! Hi Guys, Sorry it’s been so long since I contacted you. Chauncey is doing well. We think of you often every time Chauncey faces something new and succeeds. Radiation is done, Chauncey was very badly burned on his chest during last two treatments. His chest hair will never grow back. Then because he was so immuno-suppressed, he was exposed to scabies, or mange and started loosing more hair so we took him to Yonkers ASC. he has been under the care there for a couple of months with great results..
Chauncey has about 6 new friends that he can walk with with no major issues and no muzzle. He still doesn’t greet well but is controllable and after a few minutes is fine. Thanks to you guys that is possible. We even felt confident enough to take him to a dog walk. He didn’t do great but ok. He still will snap if a dog comes up in his face, but if we see it coming we can control him. My husband Willem called me earlier to tell me Tank chased a bear up a tree in front of our house ! thank you , Shari for off-leash training that made Tank come back up the hill! I just wanted to thank you for the work you did with Chickie (and mostly me!) over the summer. She obeys my commands and has the “down” command nailed! She does not like to engage with other dogs, but she is not the aggressor and does not lunge on the leash since I learned the warning signs from you and am able to control her, even when another dog is out of control. Also, wanted to tell you I found that great leash you gave us – (someone had put it away in the place I keep winter hats and gloves) so it’s not lost after all! I wanted to get you these pictures of Bella with her new family sooner, but late is better than never 🙂 She is such a character, and has such comical disposition, she keeps us all amused. Everything is an adventure for her and Maxx, and they have bonded so well. 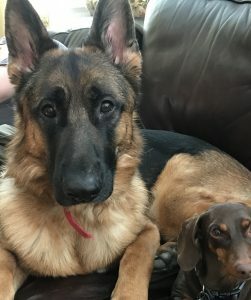 Cobie is much older, and much smaller, so he just does his own thing, but Bella has given Maxx the partner he needed, someone he can wrestle, and run and play with. As you can see by the pictures, they wear each other out and end up crapping out on Mommy’s bed. I love the picture where shes full of mud after digging her hole, and kicking up the mud puddle that the hose filled up, she has such a look of bliss on her face. I didn’t when I realized that after her picture she would turn around and run in over my couch and bed, full of mud, it was fun while it lasted 🙂 It has been such fun to watch her wonder when my Parrot Noel says hello, and talks to her, and barks when they are barking. She still hasn’t figure that one out yet. “he doesn’t look like a person, but he talk, he doesn’t look like dog, but he barks.” I want to thank you all for the wonderful work you all do, and for really caring that way you all do. God is so good to put wonderful people on this earth to be the voice, and the caretakers of our precious animals. When I first got Bella, we ran into some serious issues that had me worried, and I was so happy that Shari took the time to talk to me honestly, and to let me know about Bella’s past history, and what she herself had to deal with in young little life. It is so important to know the history of an animals previous life, as this can and most does affect their fears, insecurities, mistrust, and forms a pattern in which an animal can be totally confused, and on the defensive. Shari gave me the priceless gift of insight, and the tools to work Bella through her issues, and to understand better where she was coming from, and what was causing certain behaviors. I believe in my heart that all adopted animals should be allowed this privilege. I think that knowing as much as you can about an animal’s past is the biggest key to stop the revolving door through because they can’t speak for themselves, or tell you why they’re reacting in a certain manner, and this often leads them right back to the shelter. Being an excellent animal behaviorist like Shari, and helping me to work with Bella, just by educating me on her past, has formed a bond, love and trust between Bella and me that will take us into our old age together. WE have a solid and wonderful family pack, two legged, four legged and winged. All enjoying the wonders of each other, and the simple joys of life. My God bless you all, for all you do, and watch over all of you with the same love and conviction that you all show to his beloved creatures. Enjoy the pictures, they are worth a thousand words!! !